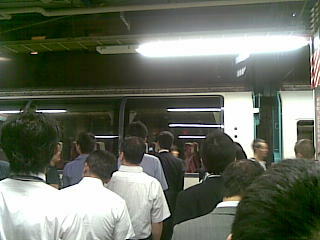 the Keitai Goddess : Well behaved commuters! All waiting like cattle to get on the super fast “Home Liner” to Odawara. Am off to have a Riot with Mj and I decided to go in style. Makes it feel like an adventure. Previous entry: Ladies that lunch! Home Liner? Wow, that sounds like fun. Does it have a living room? I love the home liner. It is fast, comfy and never crowded. It is express to Fujisawa or thereabouts - but this only means it is 15 minutes faster than the express Shonan shinjuku line. But it is still nice to have a quiet train for an hour with no annoucements and a comfy reclining seat. It is a total green car train so the ride costs an extra 500yen but for the peace and quiet it is well worth it.